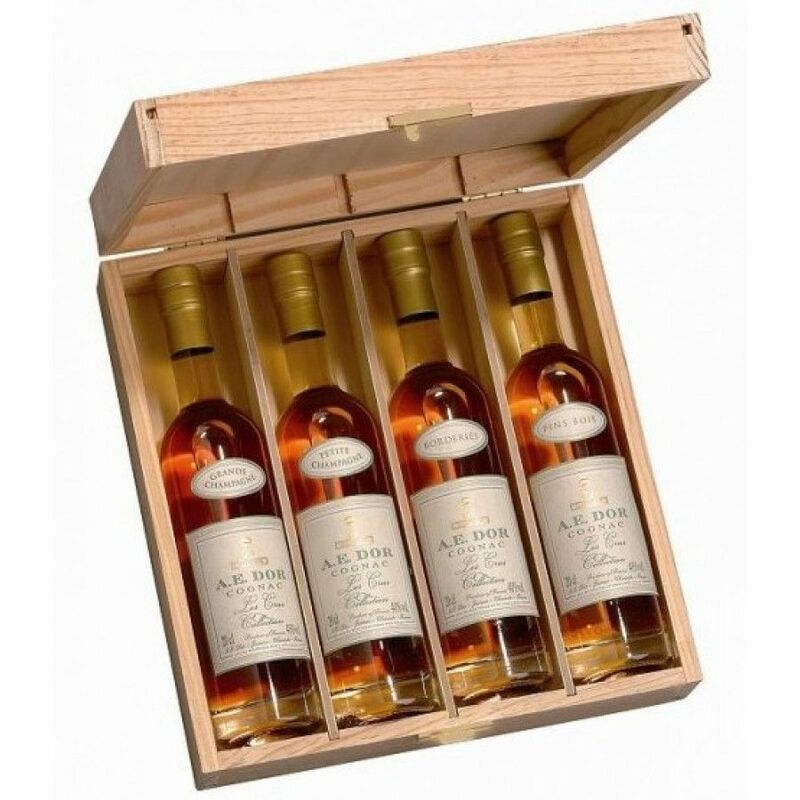 In addition to consisting of great Cognac, the bottles come in a simple, classic wooden box that makes this the ideal gift for anyone who appreciates Cognacs and/or fine liquor. Each bottle is 20cl in size, adding up to 80cl of Cognac in total. 1 x bottle A.E. Dor Borderies Cognac: Eaux-de-vie from the Borderies is distinct and delicious. The smallest of the crus, (with the exception of Bois Ordinaires), Cognacs from this unique plateau of land are infused with floral aromas and flavors - in particular that of lavander and violets. Interestingly, these wines mature to their optimum in a shorter time than those from other areas. Being that the growing area is small (only 4,000 hectares), such Cognacs are somewhat less common than those from other regions. 1 x Bottle A.E. Dor Fins Bois Cognac: Beautifully floral, with heady, fruity aromas, this is a classic Fins Bois delight. Cognacs from this region are becoming more and more sought after as people discover the delights that growing areas other than the famous Grande Champagne and Petite Champagne bring. This is a great example of such a Cognac. 1 x Bottle A.E. Dor Grande Champagne Cognac: Showcasing all that is great about the 'premier cru' of the region, this delicious Cognac is light and floral - just like a Grande Champagne Cognac should be. Enjoy in the traditional manner - neat, as a digestif - or for the more adventurous, drop in a block or two of ice to release further subtle flavors and aromas. 1 x Bottle A.E. Dor Petite Champagne Cognac: Cognacs hailing from the chalky soils of Petite Champagne possess much of the attributes of their neighboring big brother (Grande Champagne), but with a slightly more rustic tone. Take advantage of having such Cognacs from the same producer to carry out your own taste test.